Saraswati has been worshipped continuously for about 3 millennia or so. Unlike the Theoi, the Vanir and Aesir, or the gods of the many Celtic lands, she has never been without devotees. This doesn’t mean that Saraswati’s worship is static and unchanging. Indeed, this is most certainly not the case, as in the Vedic period she was the goddess of a river that is now gone. The most important change in My Lady’s worship however, was her syncretization with the goddess of speech Vac, which occurred during the Vedic period (ca.1750 BCE – 800 BCE). Today, Vac is mostly forgotten as Saraswati has totally assumed her function. I breathe a strong breath like the wind and tempest, the while I hold together all existence. Beyond this wide earth and beyond the heavens, I have become so mighty in my grandeur! Just how thoroughly has Saraswati subsumed Vac’s role? The successors to the Vedas, the Brahmanas, contain a number of famous myths starring Vac, including a creation myth involving Her and her father Prajapati, as well as a story called The Barter for Soma. Both these stories survive to this day, with one important change – Vac is no longer in them. 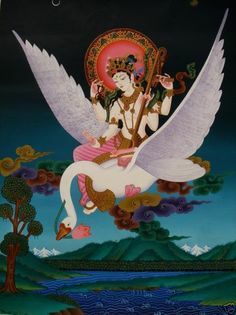 Saraswati is, instead.